The story of Sweeney Todd: The Demon Barber of Fleet Street is, by now, wholly ingrained in the collective imagination. Even if you haven’t seen the show (or the highly successful film adaptation), you will be aware of Sweeney Todd’s barber shop from which a surprising number of clients never return and the enterprising thrift of Mrs. Lovett, whose pies go from bad to brilliant with some choice new ingredients. 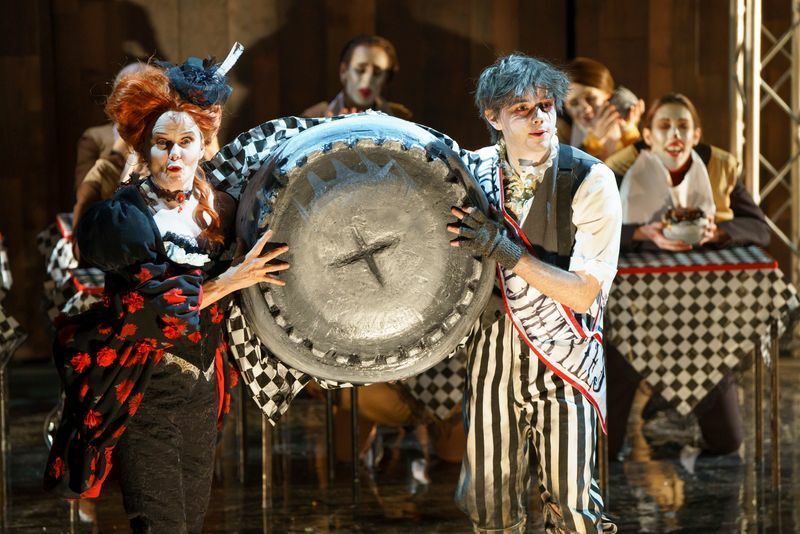 Written by Hugh Wheeler, with music and lyrics by Stephen Sondheim, Sweeney Todd is undoubtedly a musical masterpiece. Here, NI Opera, in conjunction with the Lyric Theatre, Belfast have created a musical and visual treat, perfectly capturing the dark, tortured heart of this tale of love and revenge. Following a visually arresting opening number, we are drawn into the squalid world where Mrs. Lovett (Julie Mullins) is barely getting by, selling the self-described worst pies in London, due to the prohibitive cost of meat. She soon finds an ingenious solution to her predicament with the arrival of a new tenant, the brooding and mysterious Sweeny Todd (Steven Page). A former convict recently returned to London, Sweeney is hell-bent on revenge against Judge Turpin (Mark O’Regan), the man he holds responsible for the loss of his freedom, his wife Lucy and his beloved daughter Johanna (Jessica Hackett) and anyone else who might get in his way, or end up in his barber’s chair. What follows is a Grand Guignol masterwork of horror and black humour as Sweeney’s need for revenge spirals out of control. 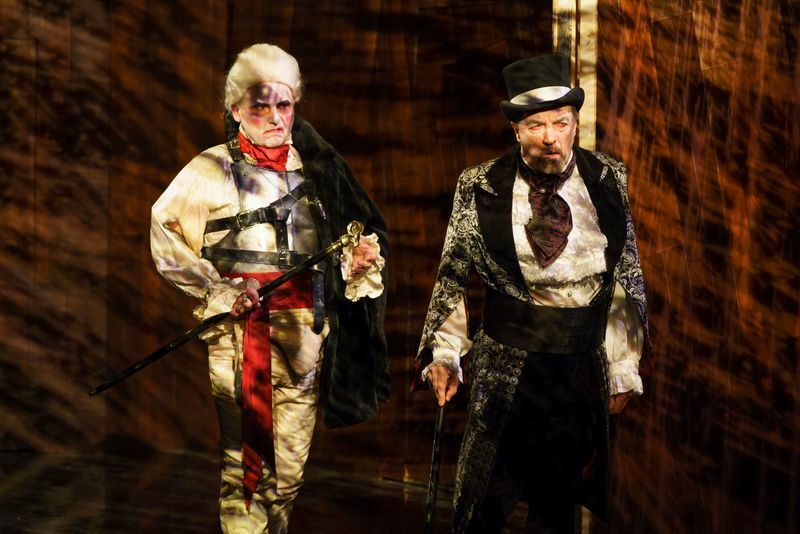 As directed by Walter Sutcliffe, this production deftly marries the shifts in tone to create a production that elicits thrills as sharp as Sweeney’s beloved razor blades and laughs as delicious as Mrs. Lovett’s pies. The set and lighting play a massive part in the success of this production. Dorota Karolczak’s claustrophic set – all wood panelling and mirrored surfaces – feels at times like the pit of hell. Wolfgang Göbbel’s lighting is harsh, creating threatening, brooding shadows and the use of UV lighting cleverly exposes the frenzy underneath the polished veneer. The costumes hint at the Victorian roots of the tale, but a simple colour palette keeps the production ageless. Steven Page, pale and striking with a menacing death stare, manages to elicit sympathy as a man from whom everything has been stolen. His descent into murderous rage is a gradual one, making him as much a tragic figure as a terrifying monster of epic proportions. Julie Mullins, who eagle-eyed audience members of a certain age may remember from her memorable turn in Neighbours, steals the show as the romantic but wily Mrs. Lovett, whose moral compass is easily derailed by her love for Sweeney and her need for cash. The scene where she discovers the first of Sweeney’s victims in a trunk and her subsequent performance of A Little Priest is worth the ticket price alone. Throughout the production, she provides necessary comic counterpoint along with some of best singing of the evening. For all the bloodletting, rage and horror on display here, the production is given added depth by its insightful depiction of love in all its forms. Sweeney is driven by the undiminished feelings for the wife he believes to be long dead and the daughter he is set on rescuing. Marc O’Regan plays Judge Turpin less as a moustache-twirling villain and more as a pathetic, yet powerful man whose fantasies of marrying his ward Johanna are as far-fetched as Mrs. Lovett’s romantic vision of married bliss with Sweeney By the Sea. It is, however, the filial affection of young Tobias (Jack Wolfe) for Mrs. Lovett that is provides the most affecting moments of the production. He brings out her maternal side and their duet ‘Not While I’m Around’ is a poignant promise of a protection that neither of them can really offer. Tobias embodies the human cost of Sweeney’s revenge and Jack Wolfe’s performance is subtle and heartbreaking. Any unevenness in the production comes more from the source material itself. The first half is overly long with some sluggish pacing and a few of the songs are underwhelming, mainly because the good songs are fantastic. The slightly insipid love affair between Anthony (John Porter) and Johanna features some beautiful singing, but is not much more than a staple of Victorian melodrama and a useful plot device. The ensemble players serve the production well with their stylised brown suits and strong voices. Elaine Hearty in particular is notable as the Beggar Woman who knows Sweeney from his past, as is Matthew Cavan as Adolfo Pirelli, purveyor of snake oil who underestimates the Demon Barber. The show features some fantastic set pieces including the brilliant pie-eating segment God, That’s Good! and the entertaining shaving competition of Pirelli’s Miracle Elixir. Special mention must also go to the able band of nine musicians, skillfully led by conductor Sinead Hayes, whose sound is a vibrant and deep as a full orchestra. Audience participation is used sparingly, only jarring slightly when an audience member is brought on stage for his own close shave, but together with the use of lighting to blur the boundaries between stage and auditorium, it raises questions of moral collusion between the audience and the work. 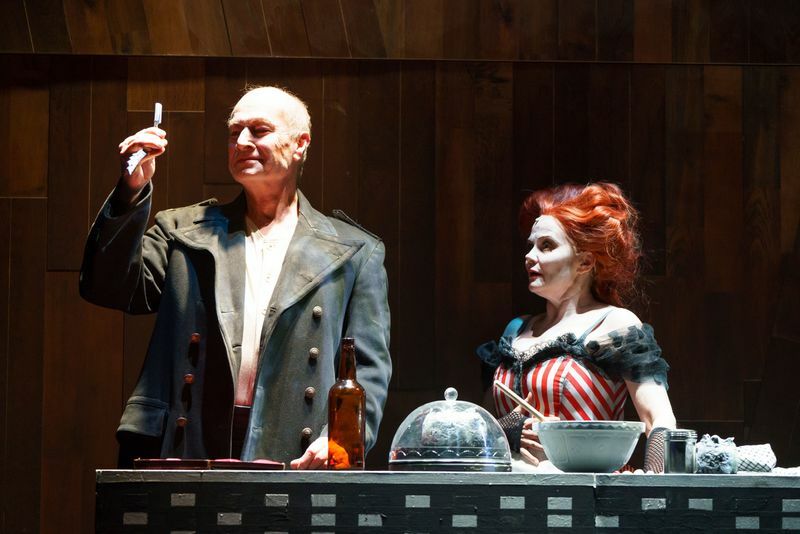 Sweeney Todd: The Demon Barber of Fleet Street is a dark, thrilling nightmare of a musical that pushes the boundaries of what the genre can and should be. This production veers from comedy to cruelty and horror to heartbreak at a lightning speed, but never sacrifices its delicacy for its darkness. This is a black, shimmering delight of a show; it may be long, but once it is over, you will want to go right back to the start to watch it again.